OMAHA—Caleb Freeman is no stranger to overcoming circumstances that might quickly discourage the average person. Since his life changed due to injuries he sustained in a car wreck on Dec. 19, 2017, Caleb has overcome obstacle aft er obstacle, citing God’s healing hand for all victories along the way. 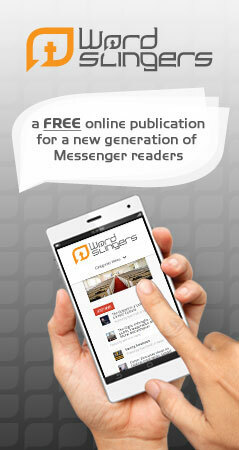 The Baptist Messenger first printed a story about Caleb and his miraculous healing in the Jan. 25 print edition. On Jan. 15, Caleb was transported from the University of Oklahoma Hospital for brain injuries to Craig Hospital in Colorado for rehabilitation. 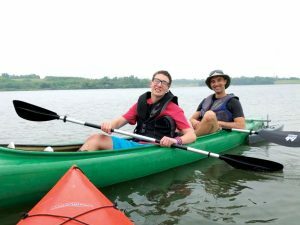 At the beginning of May, Caleb had progressed enough to transfer to Quality Living Incorporated (QLI), a post-hospital residential rehabilitation center in Omaha, Neb., where he continues to thrive and meet goals both he and his doctors set on the journey to his recovery. In fact, Caleb has progressed so much in the six months since his accident that he himself began to post updates to the Facebook page called “Pray for Caleb” that his dad originally started soon after the accident in December, as well as other social media outlets like Instagram. 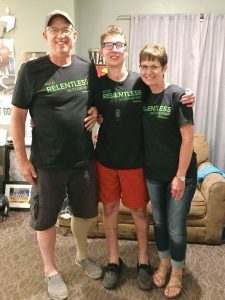 Since December, the “Pray for Caleb” Facebook page has gained more than 50,000 “likes,” and each update, or “post” is welcomed with hundreds, if not thousands, of words of encouragement and prayers for Caleb to continue in his positive direction toward recovery. 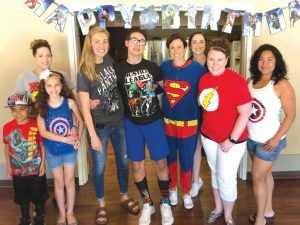 Because the Omaha facility is even closer to Oklahoma than Colorado, Jeremy and Emily, Caleb’s parents, are able to drive the family back and forth to visit Caleb, which is a vital part of his recovery. Caleb’s family continues to be a driving force behind his recovery. His brother, Clayton, who was in the car accident with Caleb brings his brother’s jersey to basketball games and lays it on the bench in honor of his older brother. Caleb has met many goals through the vigorous rehabilitation program at QLI. 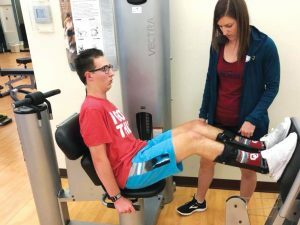 His speech, vision and balance have all improved as he does activities like occupational therapy, physical therapy, speech therapy, school work, adaptive sports and more. Caleb has gone on many outings, including a recent one for his 17th birthday, May 30. One of Caleb’s close friends, Skyler, and his family drove to Omaha to celebrate the day with Caleb and his family. Caleb received more than 200 birthday cards from friends, family and people following his journey on the “Pray for Caleb” Facebook page. To follow Caleb’s journey, visit the “Pray for Caleb” facebook page at www.facebook.com/prayforcaleb.